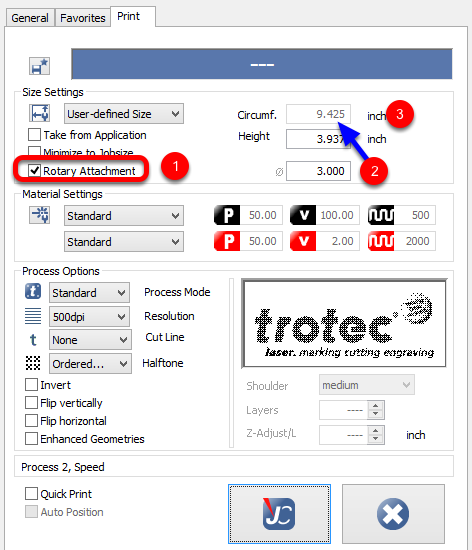 This tutorial will show you how to use the Trotec rotary attachment. 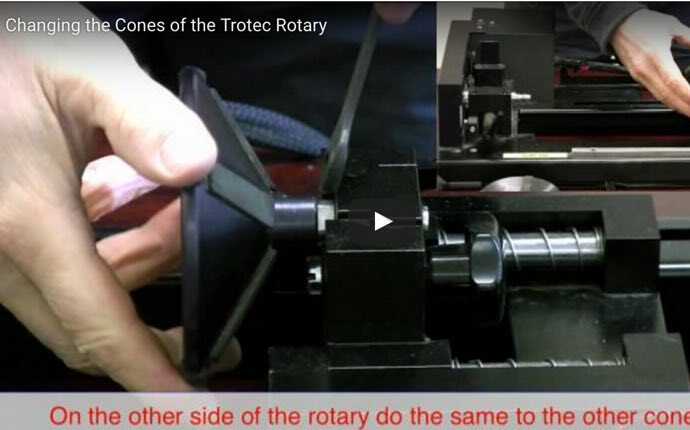 When it comes to working with the Trotec rotary there are 3 ways to create a job on the rotary. In this tutorial we will go through the first of three ways. 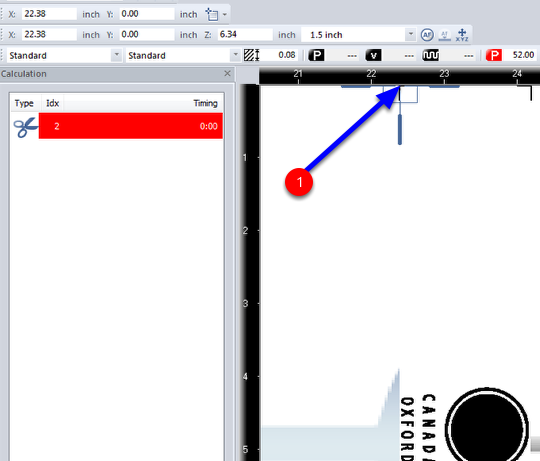 In this tutorial we will generate our logo and our page size will be determined by the diameter of the glass. 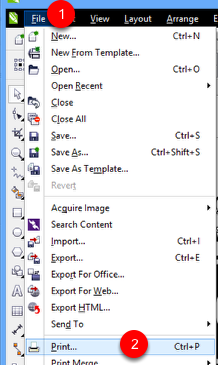 This page size will automatically be created by the driver. 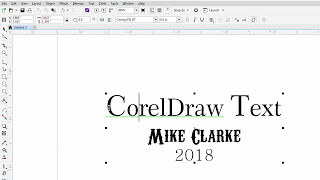 Bring your logo in CorelDraw. Resize the logo to the size you want to create it at on your glass. 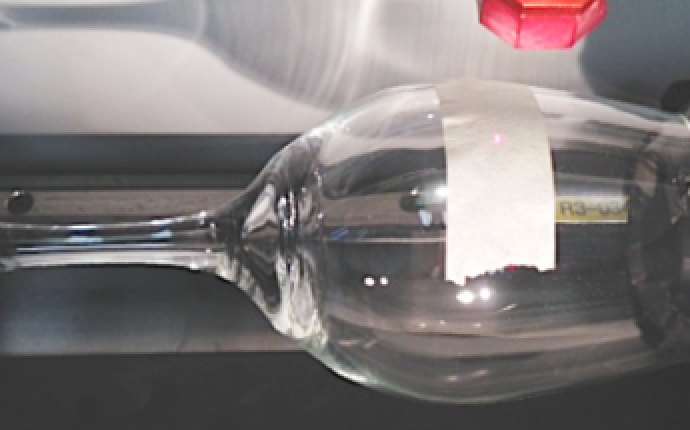 The software will automatically create a stretch factor based on the diameter of the glass. 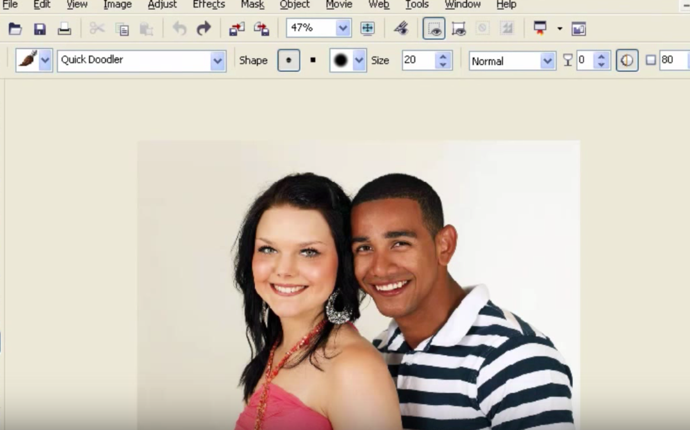 Make sure the image is black and white. With the Trotec rotary our logo needs to be rotated depending on the location of the cones on your rotary attachment. In this case our cone is on the right side of the rotary which means I need to rotate the image 180 degree so that it is upside down. 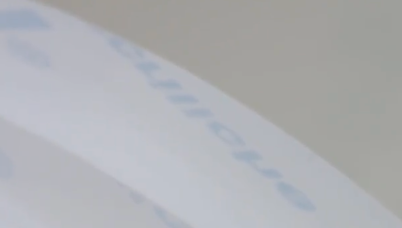 My Logo is 1.25 inches by 1.8 inches. When you are making your logo create it so it is the size that you want it to appear on the glass. In this first version I have made my page size the same size as the logo size. The page size is 1.25 in width and 1.8 in height. When you are done go to FILE | PRINT. Note: You will notice that I have the logo upside down. 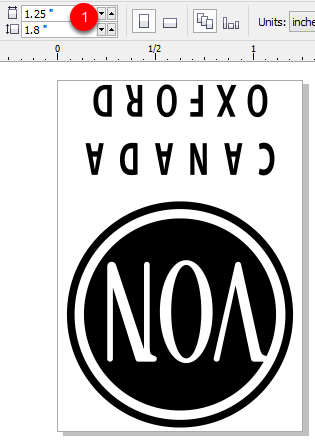 When it comes to your rotary you will create a logo either right side up or upside down. Which way you do it will depend on the way the glass is mounted in the rotary attachment. 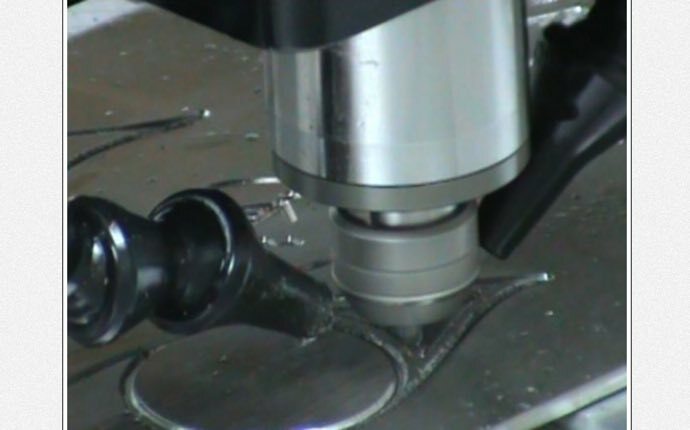 Normally most glasses are going to go into the cone at the far right side of the rotary as you are looking at the rotary from the front of the machine. 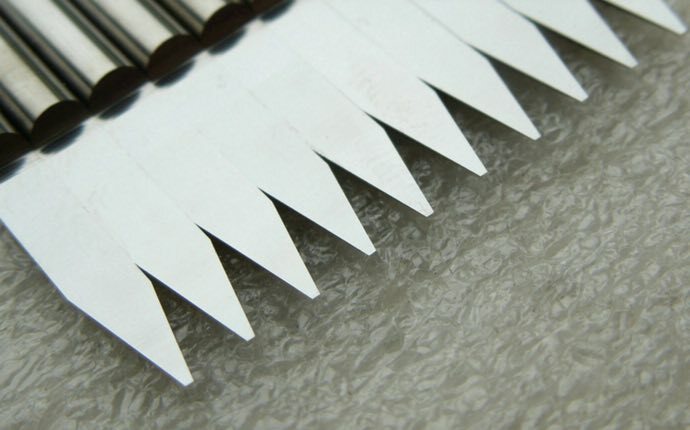 The top is at the right (1) and the bottom is at the left (flat base) (2). 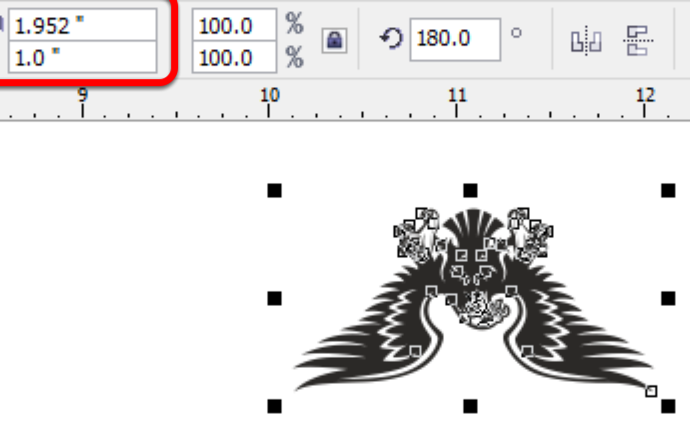 Thus for this job I need to place my image in CorelDraw upside down. If the glass was reversed in that the top was on the left instead of the right it would be placed in CorelDraw right side up. For my logo to not be rotated my cone has to be opposite of the previous image. 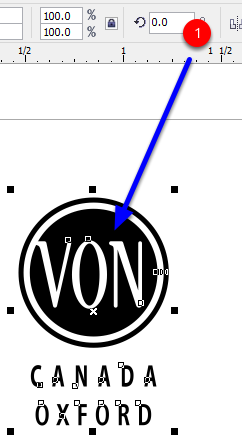 If you want your logo to be face up than you can adjust the rotation set to 0 (1). Once we have set up the job in Corel we can send the job to our laser. 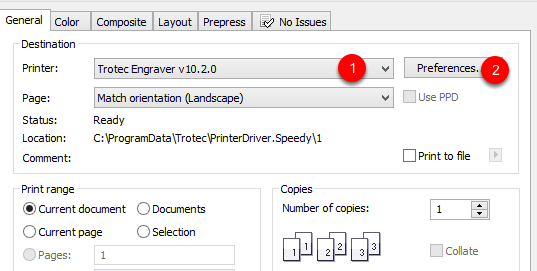 Our first step is go file print. 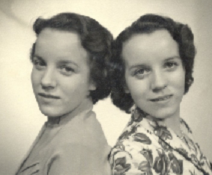 Go to FILE (1) | PRINT (2). 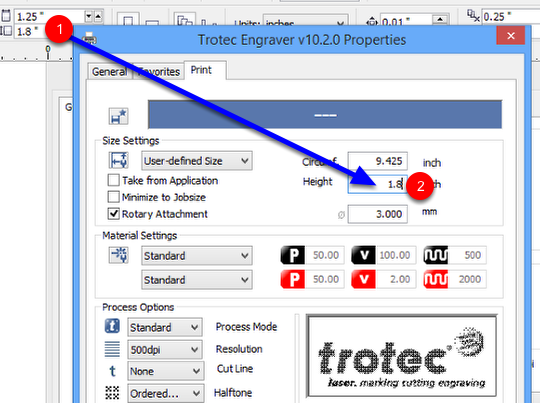 I have selected the Trotec driver (1). Next select the Preferences button (2). 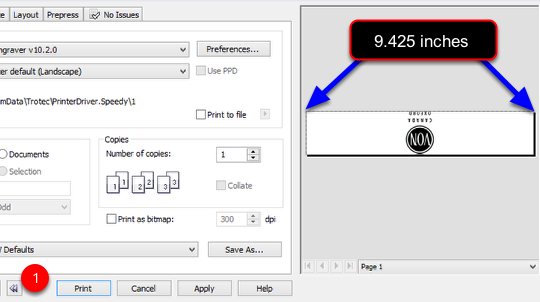 Now if you open up the print preview you will notice that the page size of our page has gotten bigger. It is now 9.425 which is the size of the page that was created in the previous screen shot. 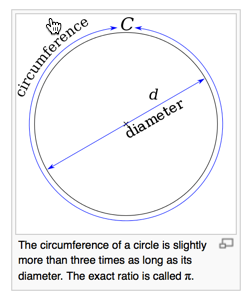 This is the diameter x PI. With the job loaded in job control we can double click on the job titled “Untitled-1” (1) and it will load to the far left corner at the 0 0 position. 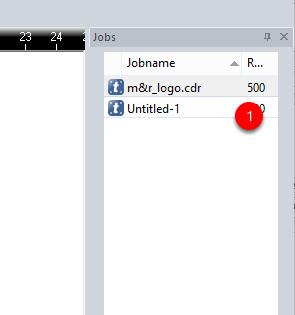 Note our job title in Job Control will take the name of the file we have created in our host program such as CorelDraw. At this point we have to understand exactly what is going on here in terms of how the glass rotates. Once you master this the rest is easy. Do not worry about the picture of the rotary in the background. It is there just to signify that the rotary attachment is being used. You can see that my logo is in the middle of the page. Although you may think that this corresponds with the rotary it does not. 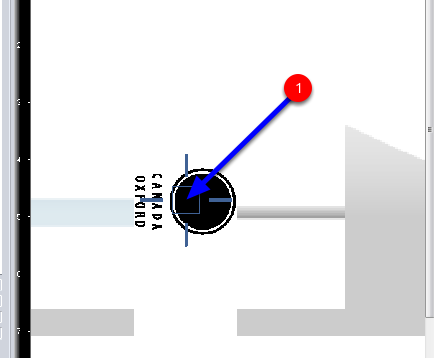 The height of this page is the full turn of the glass – the direction of this turn is towards the back of the machine. The problem that a lot of people have is figuring out the direction of the turn of the rotary. Although in time it seems simple at first for a lot of people figuring out the rotary can be somewhat intimidating. In the above image you will see that the image is in the middle of the page. 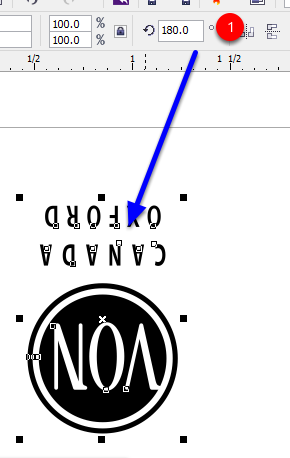 For this reason if we turn on the rotary, move our head to the center of where we want our logo on the X position and than start the job the mug will turn till it sees the first part of the logo (red arrow). The amount of the turn is indicated by the space between the two blue arrows. If you understand this than you are half way to understanding the rotary attachment. Thus the glass turns approx. 3 inches before it starts to laser. 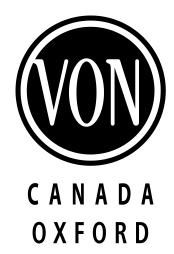 This can make it hard to know where the logo is to be located. 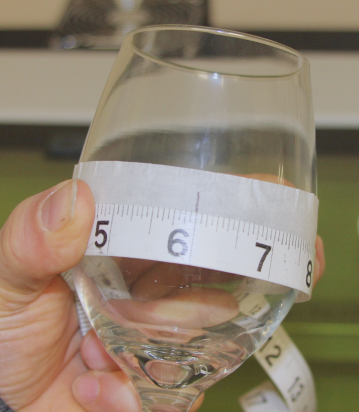 Now this issue is not too critical if you are doing a high ball glass or a wine glass as there is no handle and it does not matter where the logo goes in terms of around the glass. When it becomes an issue is if you are doing a beer stein or a mug where there is a handle. 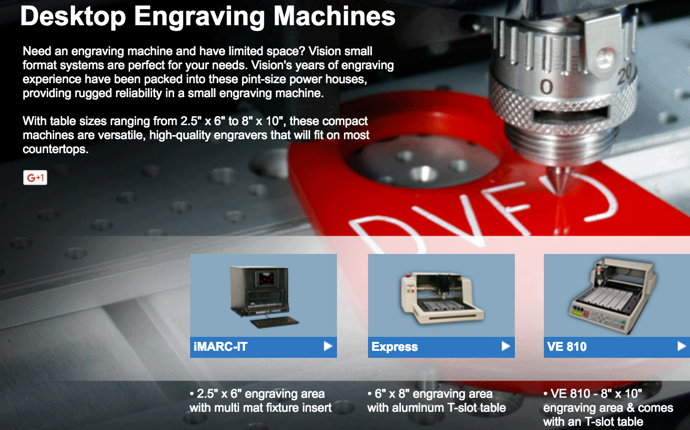 The last thing you want to do is to start engraving on the handle or on the wrong side of the glass. 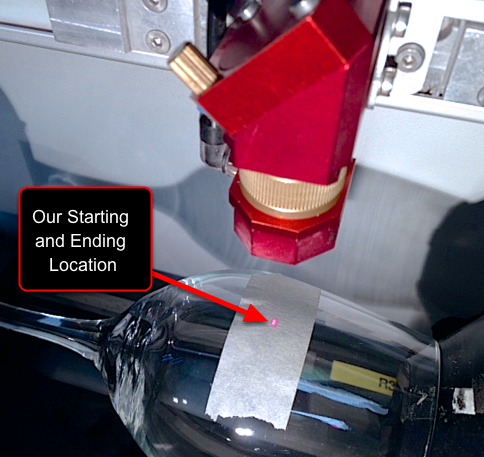 In the case of this example you will see that once the bottom of the logo is reached by the laser the machine will return the glass to is starting position. 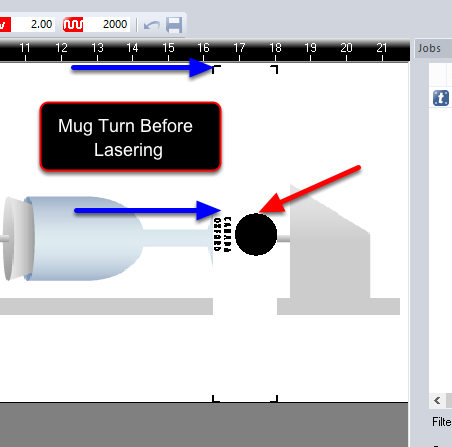 As you can see from this image the laser head when you first turn it on is parked at the top of the page. If you did not have the rotary attachment installed than as you move the laser head down towards the front of the machine (Y Direction) than the arm of the laser will move down. With the rotary attachment installed the arm does not move the glass actually rotates. As I press the down arrow on the keyboard the glass will start to rotate. When we want to move the lens assembly (the lens) to the left or the right you press the left or right arrow key (3 and 4) The left arrow (3) moves the lens left. The right (4) moves the lens right. When you want to rotate the glass you use the up and down arrow keys (1 and 2). 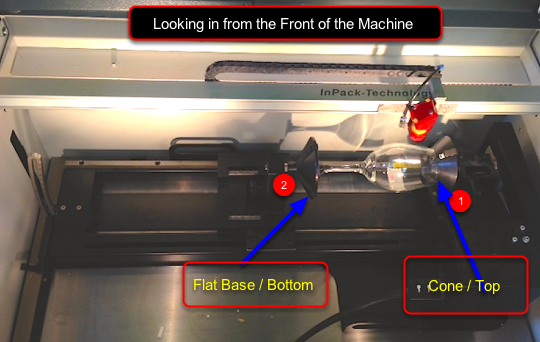 The top arrow moves the glass towards the back of the machine (1) the bottom arrow moves the glass forward or closer to the starting point. 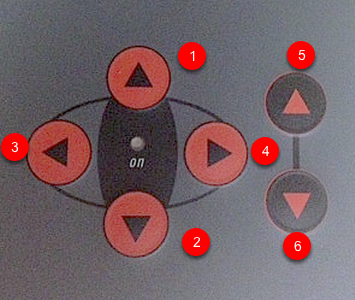 Arrows 5 and 6 are our up and down focus buttons. The up arrow (5) moves the table up. The down arrow (6) moves the table down. 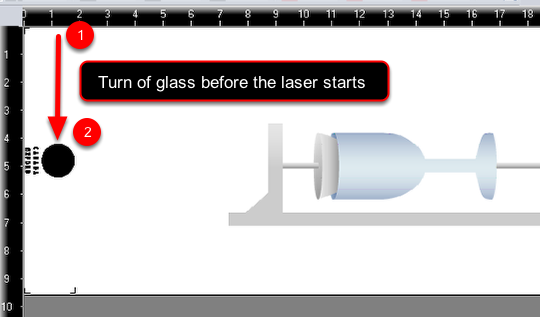 With the way we have the artwork setup we need to press the down arrow on the laser control panel – see previous image, until the head is over out artwork (1). If we need to line up left or right on the horizontal position than we need to press our left or right arrow keys on our laser control panel (3 or 4 in the previous image). 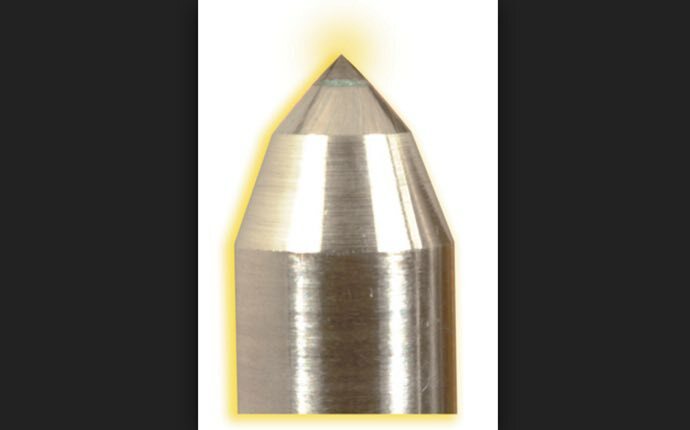 If you use this technique than the machine head will tell you exactly where the engraving is going to start. If you are using this type of set up than the one thing that you may want to happen to speed your setup is to have the rotary return home to the starting position of where you started. For example if you located your image so that it was located at the center of your page than every time the laser job is finished the glass will turn back past the image and keep turning until the glass rotates past the original image. What we want to do is to have the glass return to its starting point which in this case would be the middle of the job. Thus we want to rotate the glass till it is in the middle or starting point of our logo as per the previous slide. 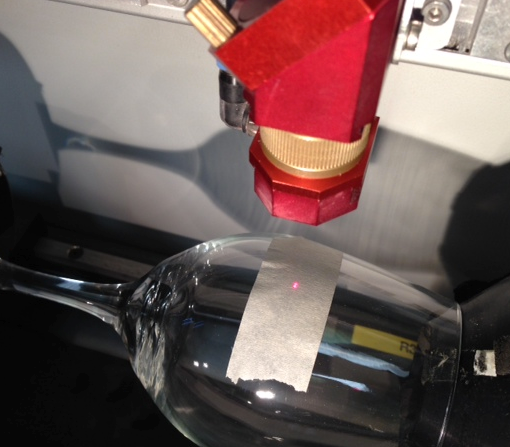 To have the laser head return to its starting position we need to make sure that this setting is setup in the driver. 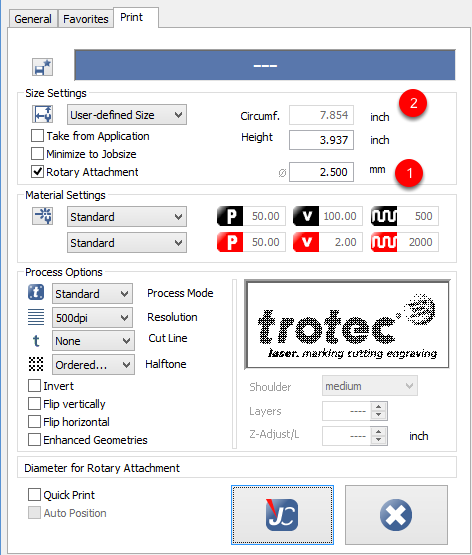 To do this go to SETTINGS | OBJECTS | PROCESS OPTIONS (1) | LASER HOMING (2). Thus if we want the rotary to finish in the most optimum location it is here as per the above photo. We started here we want o finish here. If our logo is in the middle of the table it will continue to turn to go back.